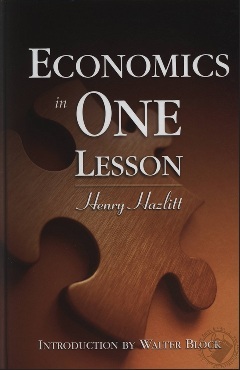 Synopsis: A book about understanding the basics of economics and exposing commonly-believed economic fallacies, written by one of the great lights of the Austrian school, Henry Hazlitt. This short, concise little book is an enduring classic. Strong Points: This is a fantastic book. It was written in 1946 but is still as relevant today as the day it first came off the printing presses (the reader will not notice any signs of the book feeling dated). It is a small book, yet its lesson is powerful and profound. The reader who engages it will find their perspective on the world and its economy permanently enhanced. The writing style is very lucid and easy to follow, and the logic is impeccable. It is an enjoyable book to read, yet it teaches so much in so few pages. Pound-for-pound, it is probably the best reading a person could do to understand the principles of economics. It is definitely the best book to train a reader to think like an economist. This is a book that deserves to be read and re-read. Weak Points: The last few chapters seemed to get a little more involved and the reader may not enjoy the same sense of ease that they did with the previous chapters. Also, there may be a few terms such as "consumer good" and "capital good" that are left undefined for the reader, which may leave the introductory reader bewildered. Selected Quote: "In this lies almost the whole difference between good economics and bad. The bad economist sees only what immediately strikes the eye; the good economist also looks beyond. The bad economist sees only the direct consequences of a proposed course; the good economist looks also at the longer and indirect consequences. The bad economist sees only what the effect of a given policy has been or will be on one particular group; the good economist inquires also what the effect of the policy will be on all groups. "...From this aspect, therefore, the whole of economics can be reduced to a single lesson, and that lesson can be reduced to a single sentence. The art of economics consists in looking not merely at the immediate but at the longer effects of any act or policy; it consists in tracing the consequences of that policy not merely for one group but for all groups." (p. 4, 5).